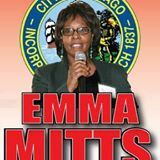 Mitts secured about 48.7 percent of the 8,023 total votes cast in Tuesday’s municipal election for the 37th Ward, according to the unofficial results compiled by the Chicago Board of Election Commissioners. Her 3,910 votes fell short of the required 50.1 percent she needed to win another four-year term. Stamps won 32 percent (2,593) of the vote Tuesday. Maretta Brown-Miller, a Chicago Park District employee, won 13 percent (1,056), while former CAPS beat facilitator Leroy Duncan came in last with about 6 percent (464). Mitts and Stamps will meet in the April 7 runoff. Mitts, who was appointed to the Chicago City Council in 2000 by then-Mayor Richard Daley, had garnered at least 58 percent of the vote in the past three municipal elections, city election records show. In her first run in 2003, she won 73 percent. “I feel like a 6-year-old on Christmas,” Stamps said in an interview during her election party at Grill on Grand. Stamps said she’ll spend Wednesday catching up on sleep, then get back to “saturating” the community with her message so residents show up to the polls in six weeks. About a half-hour before official results came through, Mitts told her supporters to celebrate as if she’d won. Mitts said “union folks” could also have been a factor in fewer votes for the alderman. 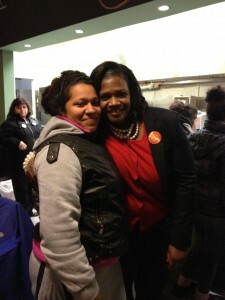 Stamps was endorsed by the Chicago Teachers Union, which pumped at least $42,000 into her campaign. When the numbers came in, Mitts thanked everyone who worked for her and said she’d “bring the bacon home,” but she laid some blame on anyone who didn’t go to the polls. Mitts told AustinTalks Tuesday night that she will continue to focus on bringing quality schools, economic development and less crime to the ward if she wins the runoff. During her election night speech, she said she’s not afraid to bring more charters into the area and that she supports parents’ rights to choose where their child goes to school. Throughout the 37th Ward campaign, Mitts has been criticized for being a rubber stamp of Mayor Rahm Emanuel (who also faces an April runoff) for almost always voting with him. Mitts defended her voting record, saying she supports whomever is holding office but will disagree when she needs. When asked to cite a time she’s disagreed with the mayor, Mitts said she couldn’t recall a time. Stamps made some of the same promises the incumbent had, while also vowing to increase transparency in the alderman’s office. She repeated her belief that Mitts does not keep in touch with the community, which the first-time candidate promised to change. She said she was happy for Stamps, but could not understand how so many people could throw their support behind a woman who has lived in the ward just few years. She said she’d have to do some research before voting in the runoff election. Duncan could not be reached for comment Tuesday night.